A commercial quality 1/2" x 50' red rubber hose with 1/2mnpt brass end fittings and 300psi pressure rating by a US manufacturer. 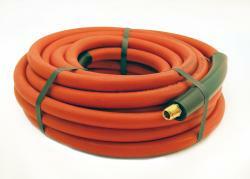 Hose fitting bend radius supports and durable cover greatly increase the service life of this hose. A commercial quality 1/2″ x 50′ red rubber hose with 1/2mnpt brass end fittings and 300psi pressure rating by a US manufacturer.